2) "Xpress Write" works just like 'Write', but it keeps disk format on the UFD. Warning: To keep consistance of bootable UFD, files with same name as in the opend ISO image will be replaced. Backup your data on your UFD is recommanded before 'Xpress write'! 4) As well you may change boot sector of your UFD with 'Write New Boot Sector', for example change a DOS bootable UFD to WinPE or Syslinux bootable UFD. Additional system file should exist in your device. 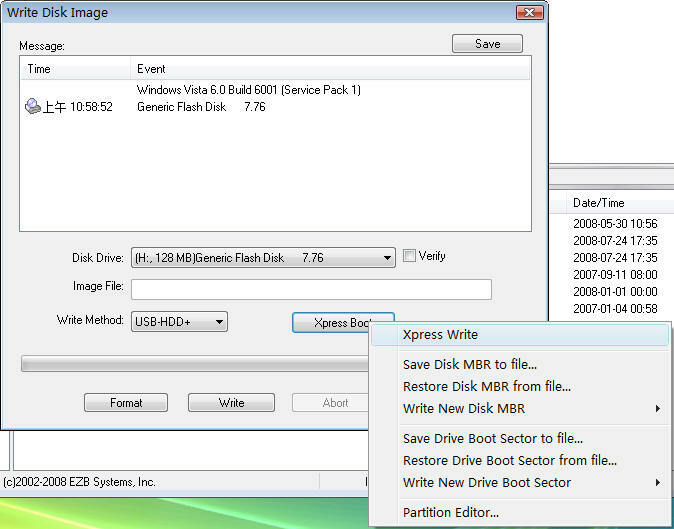 5) 'Partition Editor' may help you to Active/Hide partition on USB hard disk's with multiple partition.